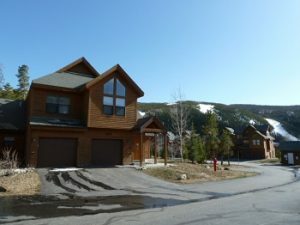 Snake River Village Condos in Keystone CO Real Estate are centrally located between both the Mountain House and River Run in Keystone, Colorado. While their legal name implies they are condos they function more like townhomes with separate exterior entrances for each property and attached garages. Snake River Village Condos were built in 1995/1996 and have a total of 49 residences comprised of 32 – 2 bedrooms, 14 – 3 bedrooms, and 3 – 4 bedroom properties ranging in size from 906 – 1811 square feet. Each property has their own garage, the 2 bedroom units have 1-car attached garages, while the 3 and 4 bedroom units have 2-car attached garages. The majority of the residences at Snake River Village Condos have great Keystone Ski Area views. As an owner or guest of Snake River Village Condos you have use of the 2 common area hot tubs located steps from each residence. Nearby you can walk to River Run where there are several restaurants, shops and the Gondola for skiing/snowboarding. If you don’t want to venture too far away there is always the Snake River Saloon, Haywood Cafe, The Goat and Dos Locos within a few hundred yards from the Snake River Village Condos. If you are looking for Summit County Real Estate and are unsure of the different areas and properties, let us assist you in finding the right property for you and your family.